Products are listed alphabetically, use our product filter to help identify the proper head for your machine. If you do't see your model listed, send us an email to sales@holbren.com and we'll see what your options are. 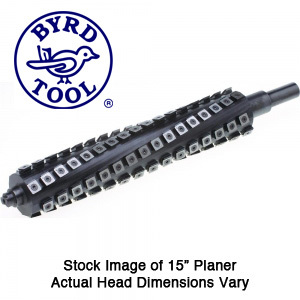 Whether you are a woodworking pro or just enjoy do-it-yourself, the Byrd Shelix spiral cutterhead is the ultimate upgrade for any jointer or planer. Each Shelix cutterhead with four-sided solid carbide inserts is factory machined to exact dimensions. A smooth and easy installation is possible and no need modifications are needed. With the Byrd Shelix long life solid carbide cutters you can make tear out free cuts in figured wood. Benefits include reduced noise, improved chip collection and there is no more setting knives.